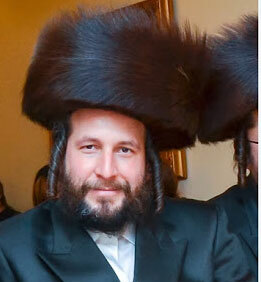 More than 40 family members, friends, and some who didn't even know Reb Menachem Stark filled up half of the rows in Judge Neil Firetog's Brooklyn courtroom on Friday morning as one of Mr. Stark's accused killers was arraigned. Kendel Felix, 26, of Crown Heights, who had done some contract work for Mr. Stark, pleaded not guilty to robbery, kidnapping, and second-degree murder charges. The murder charge alone carries a sentence of 25 years to life. The large presence of Williamsburgh residents in the downtown Brooklyn Criminal Court building followed a public letter from Mr. Stark's family urging the community to "show support"
"We felt the same way every yid felt," a 31-year-old community member told Hamodia. "I dealt with Mr. Stark in real estate," said another courtroom visitor. "This was a shocking tragedy." At his arraignment, Felix, accompanied by his defense attorney, Alex Schacht, spoke very little other than to state his not-guilty plea. He was brought into court from Rikers Island, where he has been held since April without bail; prosecutor Eric Blanc asked Firetog to keep it that way, and the judge agreed. Felix "is not going anywhere," Blanc assured the family. Felix's two alleged accomplices remained at large as of presstime.The investigation – which already has generated hundreds of police and lab reports – was continuing. The case is particularly time-consuming, because Felix and his alleged accomplices have no criminal histories. Felix's DNA, for example, was not previously in any police data bases. Investiagtors essentially had to start from scratch to arrest Felix and build their case. Police say the perpetrators apparently had intended only to rob Mr. Stark, who they believed often carried large sums of cash on his person. But the plan "went terribly wrong," a source told Hamodia. One theory is that one of the men sat on Mr. Stark to control him, accidentally suffocating him. Nonetheless, Felix and the other suspects will face murder charges, since under New York State law, if a victim is robbed or kidnapped, and is killed – accidentally or intentionally – during the course of the crime, the perpetrator is charged with murder. "We're happy that we have one [of the accused]," Mendel, another friend of Mr. Stark, said after the arraignment. "Now we're just waiting for the others." Mr. Stark was forced into a car late Thursday nught, Jan. 2 in Williamsburg during a snowfall by at least three men. The crime was caught on surveillance video. The large turnout at the courtroom vividly belied the headline in a January New York Post story on the crime: Who DIDN'T want him dead? "We stand as One Brooklyn in condemnation of the New York Post's coverage of the murder of Menachem Stark," Adams said at the rally. "Above all else, this was a husband, a father and a member of a community that sits in mourning over his tragic passing." Mr. Stark was a married father of seven young children.